Since Coursera launched, we’ve been determined to bring students affordable and accessible course materials. Today, we’re excited to announce that we’re taking the next big step toward that mission by working with many of the top higher education publishers. This collaboration will expand the availability of the publishers’ high-quality content and resources, facilitated by Chegg, a hub where students can access tools and materials. 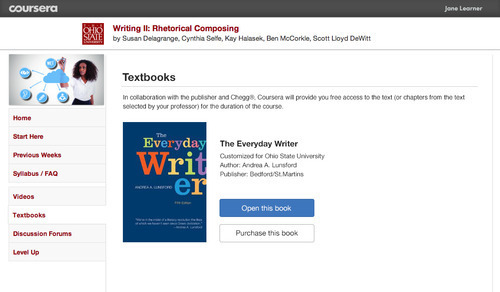 Starting today, publishers Cengage Learning, Macmillan Higher Education,Oxford University Press SAGE, and Wiley will experiment with offering versions of their e-textbooks, delivered via Chegg’s DRM-protected e-Reader, to Coursera students. We are also actively discussing pilot agreements and related alliances with Springer and other publishers. While professors teaching courses on our platform have always been able to assign high-quality content freely available on the Web, they will now also be able to work with these publishers to provide an even wider variety of teaching and learning materials. For participating courses, students will be able to access either chapters or the entire book, for free for the duration of the course through the Chegg e-Reader. They can use this reading to deepen their knowledge. Students will also be able to purchase full versions of e-textbooks provided by publishers for continued personal learning. What will be the first courses offering e-textbooks through these collaborations? Do we need to download the e-Reader software? No, Chegg’s e-Reader with the assigned e-textbook will be available through your browser. Will professors continue to use other materials or are course materials exclusively being provided by these publishers now? Professors will continue to be able to use course materials other than the content provided by these publishers. How long will the content be available? The publisher content will be free and available for enrolled students for the duration of the class. If you wish to use the e-textbook before or after the course, they will be available for purchase. Coursera is committed to making a great education accessible to anyone. We are proud to be taking this important step in that direction.